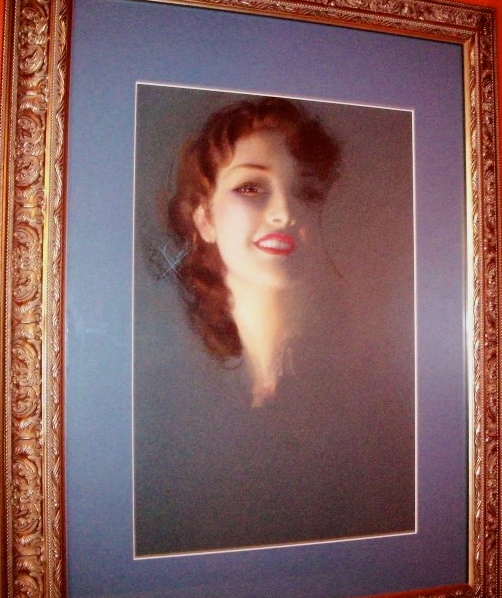 The flamboyant signature of Rolf Armstrong accompanied hundreds of equally spectacular portrayals of beautiful models and movie stars, glamorized to the ultimate degree. For many years his covers appeared on Photoplay, College Humor and Metropolitan Magazine; his girls also advertised products such as hosiery, underwear, lipstick and phonograph machines. But his greatest success was in the calendar field; Brown & Bigelow printed his subjects by the million for many years. Armstrong’s success was based on solid training – three years under John Vanderpoel at the Art Institute of Chicago and further study under Robert Henri in New York. To pay for his education, he gave boxing and baseball lessons – he was a good athlete – and worked at many other odd jobs. Early on, Armstrong discovered pastel and learned to exploit its special qualities in depicting flesh under complex arrangements which contributed an exotic flavor to his beauties.